Donte Palmer is just the newest face of a movement that's been going on for quite a while: to install baby-changing stations in men's bathrooms. A photo of a man changing a child's diaper in the men's restroom shows that diaper-changing stations in men's restrooms are still to rare. 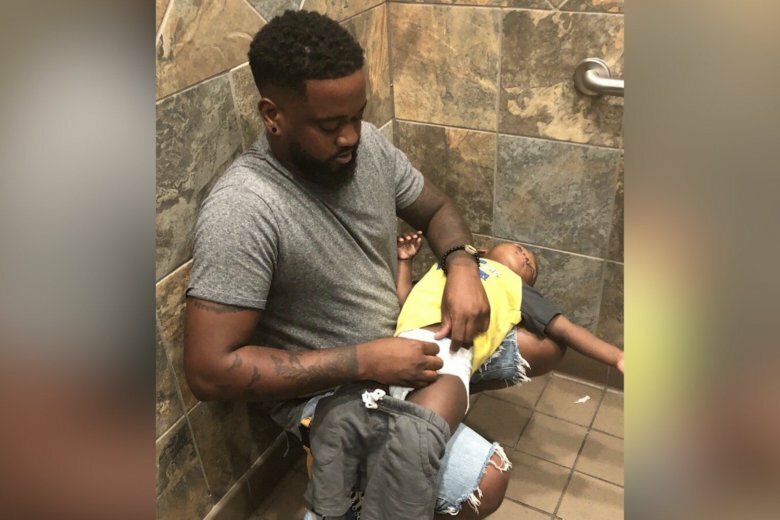 (CNN) — Donte Palmer isn’t the only dad who’s had to squat on a dirty restroom floor to change his baby’s diaper. He’s just the newest face of a movement that’s been going on for quite a while: to install baby-changing stations in men’s bathrooms. So he did what had to be done: He picked up his baby, recruited his eldest — 12-year-old Isaiah — and headed for the men’s room.